I finished some socks just in time for Easter. The yarn is Yarn Love Juliet in the color Lovely. And they are. Lovely. Won’t you sing along with me? Never saw you look quite so pretty before. Never saw you dressed quite so lovely, what’s more. 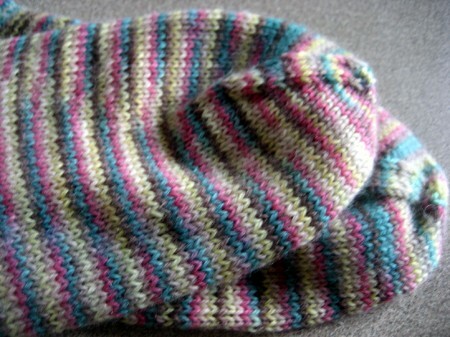 For some people it’s a bonnet but for me it will always be socks. No surprise there, eh? Do you make the foot wider than the leg, or is that appearance an artifact of the photography? If so, do you just reduce less through the gusset? Very pretty. They look so springy!! Socks seem so much more fashionable than bonnets these days. 🙂 Yours are great! from the cuff down? And how to you do that picot edge? And they just seem to say “it’s spring! !” Gorgeous! No surprise at all! The little edging is very springy. Hats aren’t in right now, but socks ALWAYS are. your feetsies are all ready for easter! Very cute! Esp with the picot edge. You’ve outdone the Easter Bunny!! I though I was the only person left that knew all the words to the Easter Parade song!! Love the socks and the picot edging really looks great on them. 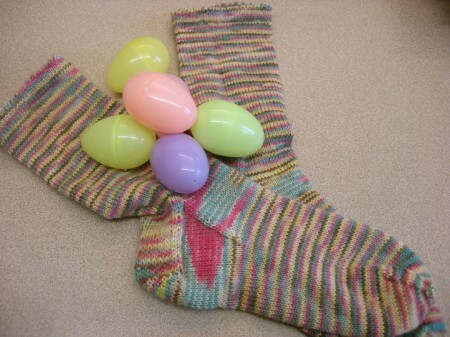 Luverly socks, just the thing for an Easter parade! No surprise at all. Lovely socks! A coworker just gave me a chocolate bunny. Quite a big one, about seven inches high. Resist! I keep telling myself. I think it will be easier to resist if I regift it. They really are lovely. Well done, Carole! And well timed. They ARE lovely socks. The picot edge is perfect. Nope, no surprise at all. Pretty new socks! Love the socks – makes me want to learn to knit some. Can you suggest a book? I love the pastels! Happy Easter! Awwh.. they are so perfectly Easter, too! Have a grand time wearing them in your own personal Easter parade. Pretty socks. 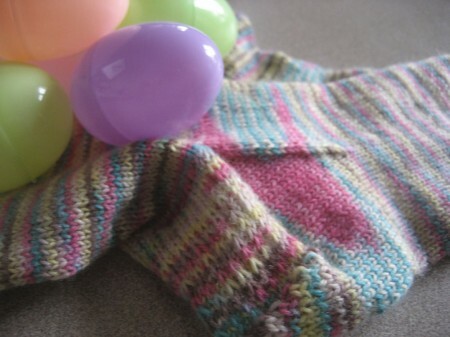 The yarn is perfect for Easter. Pretty pretty! And they look so soft! You’re making me want to knit socks, which hasn’t happened in months! Danka! OH! 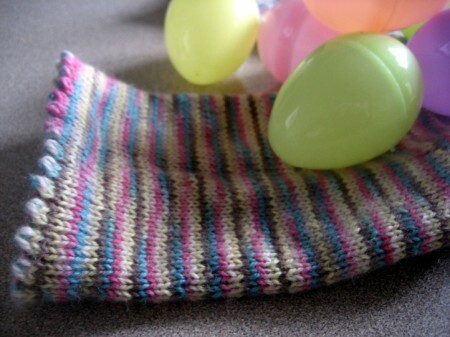 I love the pooling at the gussets – it definitely makes me think of dyeing Easter eggs. Well done!